You have to have a lot of faith in a show to start it off with a song that suggests the audience, at least those “faint of heart,” might want to leave. “Blood may spill … so if you’re smart, before we start, you’d best depart,” the cast sings in the opening moments of “A Gentleman’s Guide to Love and Murder” at the John W. Engeman Theater in Northport. No worries. Everyone at the performance I attended stayed in their seats and survived the delightful romp of a show by Robert L. Freedman (book) and Steven Lutvak (music), winner of the Tony Award for best musical in 2014. Unfortunately, that can’t be said for all the characters, any number of whom get bumped off in the course of the show after the impoverished Monty Navarro (Sean Yves Lessard, as adorable a serial killer as you’re likely to meet) learns from a family friend that he’s a member of the prominent D’Ysquith family and ninth in line to become Earl of Highhurst. Murder and mayhem result as Monty embarks on a campaign to do away with everyone ahead of him in the line of succession — all remarkably played by the talented and hardworking Danny Gardner, last seen at Engeman as Don Lockwood in “Singin’ in the Rain.” Gardner puts all he ever learned in acting class to work as he plays the entire D’Ysquith family, among them the doddering priest, the stodgy banker, the country bumpkin, the aging actress, all coming to their doom (skating accidents, slippery roofs, Monty is quite creative) in a flurry of witty if not especially memorable songs that meet somewhere between operetta and British music hall. 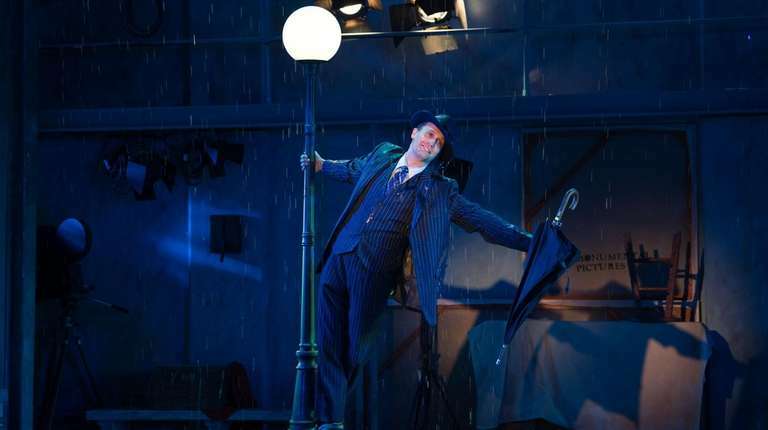 The love part of the title is represented by two young women who have their sights set on Monty — the social climbing Sibella and distant cousin Phoebe played, respectively, by big-voiced Broadway veterans Kate Loprest and Katherine McLaughlin. 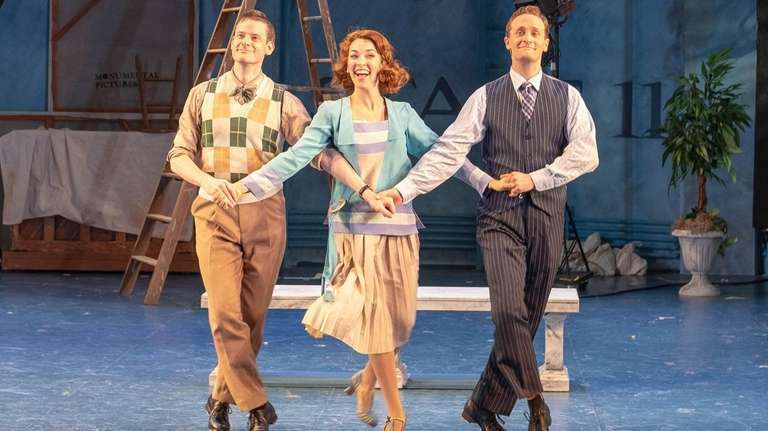 The triangle comes to a head in the amusing, farcical “I’ve Decided to Marry You” with Monty an absolute riot as he only barely manages to fend off the two ladies. Director Trey Compton and choreographer Vincent Ortega maintain a brisk pace. The cast (especially Gardner) makes quick changes that are often visible in the background of Nate Bertone’s clever set, bordered by portraits of the D’Ysquith clan that get X’d out as they do. 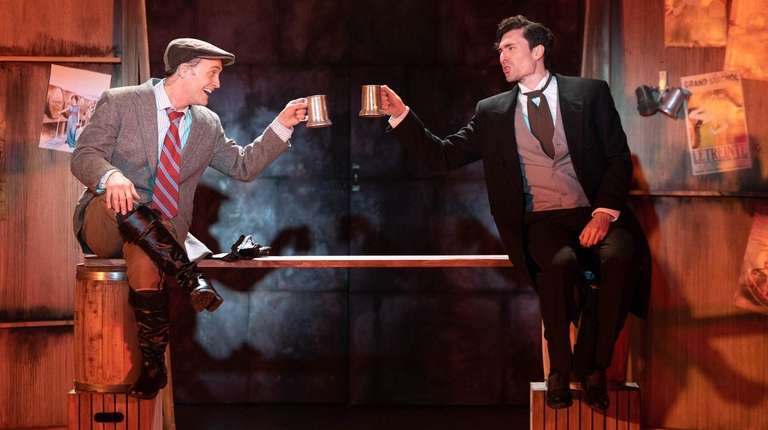 It’s all great fun, which is something you can’t often say about a play with multiple murders. Certainly, who did them is no mystery. It’s a blast from the past. 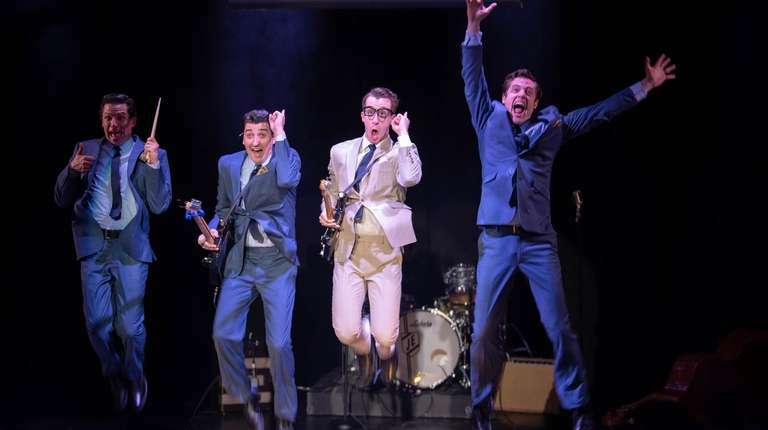 “Buddy — The Buddy Holly Story” at the John W. Engeman Theater in Northport is a rollicking celebration of the iconic singer, who consistently fought the system to make music his way. Other notable performances include Jayson Elliott as J.P. Richardson Jr., known as the Big Bopper, Diego Guevara as the hip-shaking Richie Valens and Eric Scott Anthony as Norman Petty, the producer whose tough love helped Holly reach the top. Costumer Dustin Cross does everyone up in ’50s finery — lots of crinolines and cardigans — and Jordan Janoda’s colorful set evokes the era. The biographical part of the show highlights major Holly moments, starting in a Lubbock, Texas, roller rink (a little odd, though, that the band members outnumbered the skaters), on to a not-so-successful stint at the Nashville studios of Decca, then New York, where a booking at the Apollo caused quite the ruckus because the audience expected Holly to be black. The show ends with a replication of the Feb. 3, 1959, concert at the Surf Ballroom in Clear Lake, Iowa, with Holly performing along with the Big Bopper, who gets the audience going with “Chantilly Lace,” and Valens, upping the decibels with “La Bamba” (yes, you get to sing along). A string of Holly hits goes dark mid-“Rave On,” as a somber radio voice announces all three men were killed in the crash of their chartered plane. It could have been quite the buzzkill, but the interlude was brief and respectful, then the rock and roll resumed full volume, ending with the classic “Oh, Boy!” Most everyone leaves singing, but you can’t help wonder what might have been had Holly listened to his wife and never gotten on that plane. This, you might recall, was Lin-Manuel Miranda’s first musical, started when he was still in college, well before “Hamilton” was even a gleam in his creative eye. Set on a scorching summer day, the play takes place in Washington Heights, where Usnavi (a fine performance from Spiro Marcos in the role Miranda originated) runs his bodega amid the turmoil of a neighborhood where no one is quite making it. 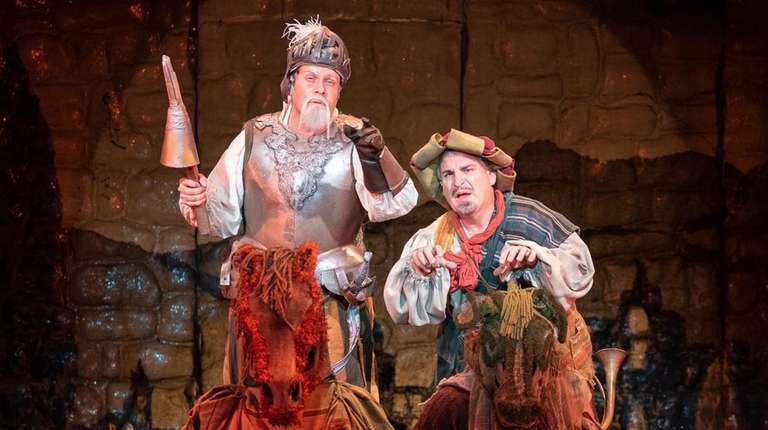 Director Paul Stancato has gathered an impressive cast, with voices that will blow you away and enough stage electricity to energize a small city. Tami Dahbura is endearing and heartbreaking as Abuela Claudia, the barrio matriarch who raised Usnavi (he’s named for the first thing his parents saw upon arriving in America, a ship that said U.S. Navy) after his parents died. Cherry Torres internalizes her pain as Nina, the girl who got out, coming home from her first year at Stanford with alarming news that sends her ferociously protective parents Kevin and Camila (Paul Aguirre and Shadia Fairuz) into quite the tailspin. “I know I wrote a show about home,” Miranda said in his rapped acceptance speech when he won the 2008 Tony for best original score. And in the end, that is the loving message of “In the Heights,” no clicking of sparkly red shoes required. The vacuum cleaner isn’t the only thing that’s stuck. In “Once,” the seductively charming musical that opened last week at the John W. Engeman Theater in Northport, the same could be said of the characters known only as Guy and Girl, two lost souls who aren’t functioning much better than her broken Hoover. The Dublin street singer and the Czech immigrant meet as he’s about to abandon his guitar on the sidewalk and give up on his music. She is a lonely pianist, struggling to raise her young daughter with a husband who’s not around. Guy, perhaps a little too conveniently, works in his father’s vacuum repair shop where her promise to pay by playing for him leads to a musical collaboration, a demo tape with major potential and the stirrings of romance. Andrea Goss, who understudied the role on Broadway, gives Girl a quiet, commanding presence, able to make things happen with but a soft-spoken word. Or a glare. Barry DeBois is less assured as Guy, perhaps because of difficulties with the Irish accent. But both are glorious when singing the pop-folk music of Glen Hansard and Markéta Irglová (stars of the 2007 indie film that the musical is based on), most notably in the haunting “Falling Slowly,” which won the original song Oscar. Interestingly, while the show is an ode to the power of music (“Ya can’t have a city without music,” says one character), there’s no orchestra. Under Trey Compton’s direction, the actors portraying all the other characters — Girl’s Ma, Guy’s Pa, a ragtag bunch of musicians — double as musicians, playing more than competent guitar, violin, mandolin and the like whenever they’re not speaking. Much of the action takes place in a finely rendered Irish pub (set by Nate Bertone) where the audience is invited to buy a drink and mingle before the play starts. There’s no happy ending, at least in the traditional sense, to this bittersweet love story, winner of the 2012 best musical Tony. But when tiny Sophia Lily Tamburo, playing Girl’s daughter, fetches a violin and joins in on the show’s last few notes, the message of hope soars with the song. The orphans missed the entrance to one of their big numbers, the dog didn’t come when he was called and one actor’s mustache (hysterically) wouldn’t stay on his face. No matter. Minor technical mishaps at a preview performance of “Annie” at the John W. Engeman Theater in Northport took nothing away from the charm of this endearing, enduring classic. It could even be said they added to it. Her six compatriots light up the stage. When they finally got together on “It’s the Hard-Knock Life,” they were, well, a knockout. And “You’re Never Fully Dressed Without a Smile” has the show-stopping quality it demands. Stealing some of the spotlight is Lynn Andrews as Miss Hannigan, the bedraggled, beleaguered matron of the orphanage. She’s a powerful belter, raising the roof in “Little Girls,” and she knows how to shake what she’s got as she flirts shamelessly with everyone from the laundry man, Bundles, to President Franklin D. Roosevelt (a pivotal character in this play). Other standouts in director-choreographer Antoinette DiPietropolo’s production include George Dvorsky as a touching Oliver Warbucks and Elizabeth Broadhurst as his loyal secretary, Grace Farrell. Jon Peterson as Miss Hannigan’s just-out-of-the-joint brother, Rooster, was appropriately sleazy. As for his errant mustache, it was so funny I wouldn’t be half surprised if the director decides to keep it in the show. 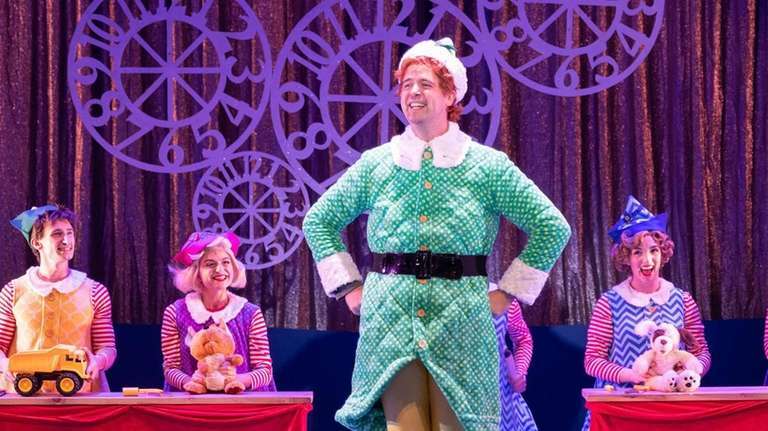 “Annie,” winner of the 1977 Tony Award for best musical followed by two Broadway revivals and countless community theater productions, has many charms. And not all of them happen onstage. Consider the pure wonder of the little guy next to me when he realized it was snowing on Christopher and Justin Swader’s lovely set, or the way parents snuggled a little closer to their children when Daddy Warbucks sings to Annie the haunting “Something Was Missing.” Or especially when Roosevelt urges his cabinet to raise their voices in the famed ode to positivity “Tomorrow,” and half the audience sings along. 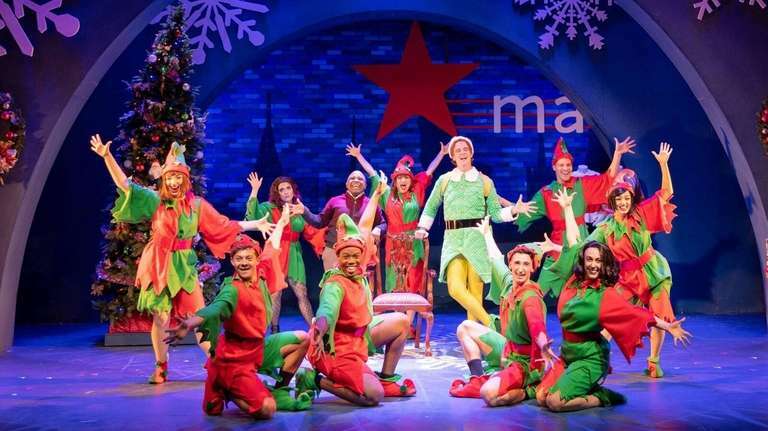 Consider this production a holiday gift from the Engeman and join them. Northport Village trustees approved zoning changes Tuesday night that will allow hotels to operate on and around Main Street. The village previously had nothing in its code that would allow hotels. Officials drafted the legislation after Kevin J. O’Neill and Richard T. Dolce, owners of the John W. Engeman Theater, on Main Street purchased a three-floor building across the street from the theater with the goal of converting it into an upscale inn. The multimillion-dollar project faced a final round of opposition from residents concerned that the hotel — and its planned 200-seat restaurant — would worsen an already congested parking situation downtown. O’Neill and Dolce still need to obtain the standard permit and project approvals before they can break ground for the hotel. Residents and Northport business owners had collected signatures on a petition that urged village trustees to address parking problems before allowing a hotel with a large restaurant to move into the village. O’Neill has said he has a vested interest in making sure that parking runs smoothly because he is committed to making the community a better place to live. The hotel, like the theater, would offer valet parking, he said. O’Neill said the partners decided to pursue a hotel and restaurant as a way to diversify revenues and ensure financial stability for the theater in the future. More than 100 people packed Northport Village hall Tuesday night, voicing overwhelming support for proposed zone changes that would allow hotels to operate on and around Main Street. Officials drafted two proposals addressing the issue after Kevin J. O’Neill and Richard T. Dolce, owners of the John W. Engeman Theater, purchased a three-story building across the street from the venue with the goal of converting it into an upscale inn. In order for O’Neill and Dolce’s project — or any hotel proposal — to move forward, village code would first need to be revised, Northport officials said. Current village law does not include hotels in its list of permitted uses of commercial property downtown, Deputy Mayor Henry Tobin said Tuesday. O’Neill said Tuesday night that it would be a “multimillion”-dollar project if the village changes the code, and he and his partner succeed in pushing their proposal through further regulatory procedures. The majority of speakers at Tuesday night’s public hearings said the village would benefit from a hotel. Many discussed the frustration of having to send out-of-town visitors to far-flung hotels elsewhere on Long Island. Barasch’s comments — and those from others supporting the new hotel — were met with applause. However, three residents spoke up with concerns about how a hotel could impact Northport’s already limited parking. Village officials said the current hotel proposal would provide one off-street parking space for each room at the inn The inn would have about two dozen rooms, proponents have said. Village trustees adjourned the hearings without voting, but kept the hearings open for future comment. Officials said they will send the two draft zoning resolutions to the village Planning Board and Suffolk County Zoning Commission for review. Northport Village could soon get a hotel. The owners of the John W. Engeman Theater have purchased the three-story building across the street from the venue and hope to transform it into an upscale inn. The three-story building at 225 Main St. would have a restaurant on the ground level, with about 24 rooms spread over the other two floors. Kevin J. O’Neill said he and his partner in the venture, Richard T. Dolce, are inspired by the inns that populate the seaside downtowns of Maine and the American Hotel in Sag Harbor. The partners purchased the building in 2016. Right now, it’s used as office space. O’Neill said he envisions a high-end, full-service hotel experience with the quaint and charming feel for which the village is known. O’Neill and Dolce presented their idea for the Northport Inn to village trustees at a February public meeting and said so far the reaction has been positive. Northport Village Deputy Mayor Henry Tobin said he thinks it would be great for Northport to have a hotel. Currently, the zoning category where the building sits does not allow a hotel as a permitted use. Village officials would have to amend the code to allow the hotel to be built, Tobin said. O’Neill said he’s hoping village trustees set a public hearing to consider amending the village code to allow for a lodging category sometime this spring. He said while the hotel will be an added benefit to the village, the restaurant will not encroach on the bottom lines of already established restaurants, pointing out the theater seats 400.